The theme of illusion versus truth is woven throughout Thaisa Frank's debut novel, which examines the Holocaust and its aftermath from a new and intriguing perspective. Within Heidegger's Glasses, many of the deceptions are absurd, while others are necessary for survival, and some are both at once. The surreal premise, while fictional, feels bizarrely compatible with the paranoia and supernatural beliefs of the Nazi regime. Ten meters beneath the woods of northern Germany sits an oversize compound, a converted mineshaft populated by sixty or so scribes: multilingual men and women who were recruited from among those waiting to be transported to concentration camps. Their sole purpose is to reply to letters written to people already in the camps, in order to reassure anxious relatives and others that their loved ones are fine and healthy. In reality, though, both the original writers and the recipients are likely no longer alive. The ruse not only conceals the truth about Hitler's Final Solution, it's also meant to ensure (in the minds of the occult-obsessed Nazis) that the dead will lie quietly, knowing their letters were answered. Although the war isn’t going well for Germany, its leaders pretend otherwise. The Compound of Scribes is another elaborate fiction: a large underground chamber built with cobblestone streets, gaslights, artificial pear trees, and false ceilings made to resemble day and night. But even though its residents' task is pointless – the letters they write will never be read by anyone – and their hideaway a monotonous prison, the existence of the program has saved their lives. Gerhardt Lodenstein and his lover Elie Schacten supervise the project, but both secretly work for the Resistance. Elie, an attractive woman admired by the others for her ability to sweet-talk SS officers and perform covert rescues, has a past she hides even from the man she's closest to. Then the lives of everyone in the Compound are thrown into disarray when philosopher Martin Heidegger's letter to his friend and optometrist Asher Engelhardt – a man he doesn’t know has been deported to Auschwitz – ends up in the hands of Goebbels, who orders that an answer be sent. How will the scribes craft a convincing response? Frank writes with clarity and compassion about the individuals given no choice but to live (and die) under the shadow of the Third Reich. She avoids the overarching grimness one might expect from the subject without minimizing its unavoidably tragic nature. The prose flows well; its tone becomes melancholy, dark, thoughtful, and hopeful in turn, and sometimes all of these simultaneously. Each character has a story that’s revealed only in part, in keeping with the heightened fear of the era. 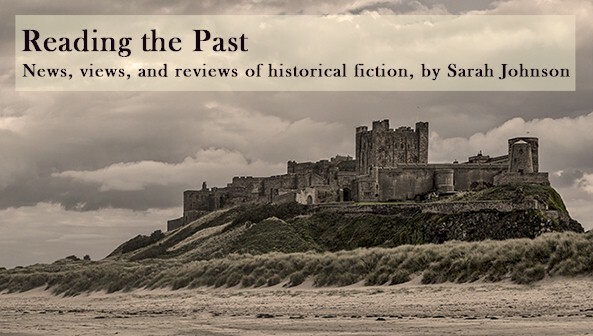 At the same time, the reader gets to experience their poignancy of their individual lives – their loves, worries, interactions, dreams, and secrets, all the seemingly little things that stand out as human in a world refracted from reality. Elements of Heidegger’s philosophy make their way into the story, though prior knowledge of his work isn’t necessary. 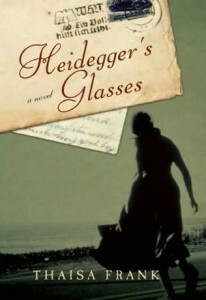 Because of its delicate approach, Heidegger’s Glasses would be a good choice for those who wouldn’t normally opt for Holocaust fiction. Its pages echo the question: what responsibility do we, the living, have towards the dead, and towards history? It’s a complex, emotionally moving work that leaves a haunting message at the end, and it does so with imaginative skill and subtlety. Heidegger's Glasses was published by Counterpoint in November at $25.00 (hb, 337pp). Your last paragraph convinced me that this might be just the book for me. I usually avoid holocaust fiction, but this sounds very good. I have heard about this book, and am glad to read your review. This is the period I dissertated on so I am always interested in it. Iris - this was a book I debated whether or not to accept for review because Holocaust fiction isn't what I'd usually read either, but I'm very glad I did. Alex - thanks for your comments, and I'm glad to have found your blog. I've linked it up to my sidebar (thanks for adding mine! ).